Due to unforeseen circumstances the 2018 Lavender Festival has been canceled. We regret to inform that we had a very difficult time maintaining the fields due to the constant rain. The lavender fields were flooded several times costing us multiple plants. We are hoping that next year will have a better luck. Again, we apologize for the late notice, but we wanted to make sure the lavender plants were at their best for this popular event. 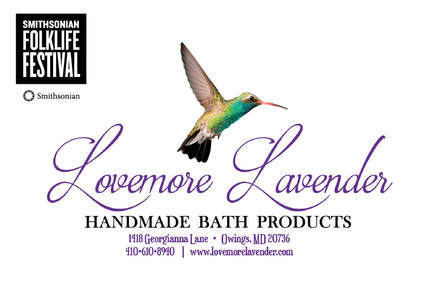 ​ Lovemore Lavender was invited to the 2018 Folklife Festival at the Smithsonian!! We were able to demonstrate the distilling of oils and offered several workshops & classes. Join us next year for even more fun!